Which technical equipment is required? Are there any other facilities you need to bring along? What should you keep in mind / consider while presenting? Everyone can be a presenter without much effort. All you need is an USB stick with your presentation. To present on a professional level laser pointers and presenters are also recommended. If you are equipped with this solid base nothing should go wrong on the technical part. Your host will surely provide the rest. You should expect a fully charged microphone, beamer, screen, speaker’s desk, and flip chart with markers or perhaps a digital whiteboard. A successful presentation is always a balanced combination of elocution and technical aspects. Those using facilities, gain a significant advantage in their appearance. With a laser pointer you can easily highlight facts and figures on a PowerPoint slide straight to the point and don’t need to turn your back on your audience. 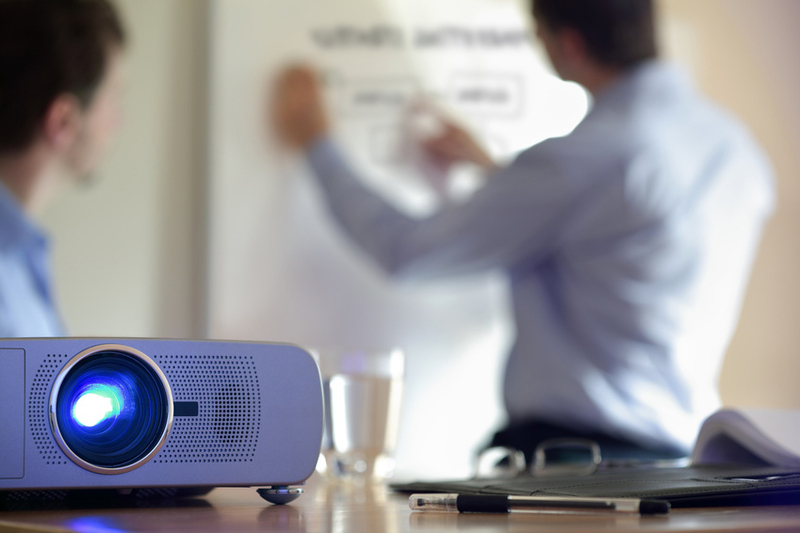 Using presenters as remote control for your presentation will compensate navigating the slides via keyboard or computer mouse.Another advantage: You don’t need to stand behind the speaker’s desk or your notebook. You are free to change your position and walk around. Just ensure that the presenter’s radio signal reaches the dongle plugged into your notebook or tablet PC. By the way: There are also presenters combined with laser pointers on the market. To present on a professional level, more aspects need to be considered. First of all you should stand while talking and not sit in front of your laptop. This will prevent the notebook covering your face. If this isn’t possible, practice the speech at home and learn how to arrange the notebook in order to follow your own presentation on the display and still remain eye contact with your audience. You may want to change your position while giving the speech. Motion attracts attention. Our eyes will not pay sustainable attention to static elements but also don’t wander around or move too much or hectic. This also counts for your laser pointer. No matter how you change your position find the suitable motion to highlight facts and figures. Distribute the handout after your presentation. Convey essential statements. Don’t summarize the whole speech. Your audience will follow your speech more focused. Making notes isn’t necessary while you are talking. Your listeners will have a better memory of the presentation later on. Last but not least: Don’t forget to bring some business cards, especially when you are giving a business presentation. You will make a lasting impression on potential affiliates or customers.